Most people in India defecate in the open, and most people in the world who defecate in the open live in India. Poor sanitation spreads a myriad of infectious diseases, kills hundreds of thousands of children each year in India, and stunts the physical and cognitive development of those who survive. While the practice of open defecation in many other developing countries is steadily being eliminated, it remains common in rural India. Why is open defecation in rural India so stubbornly persistent? A recent study conducted by r.i.c.e. in collaboration with the IGC has found that social and cultural forces unique to India can explain high rates of open defecation. 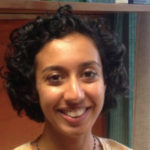 Hindu practices of purity and pollution, India’s unique history of untouchability, and the ongoing renegotiation of caste identities and status, prevent widespread use of the kinds of simple latrines commonly used in other developing countries. Our research is based on complementary quantitative and qualitative studies. The SQUAT survey studied sanitation attitudes and behaviours among 3,200 households across Bihar, Haryana, Madhya Pradesh, Rajasthan, and Uttar Pradesh. Our qualitative study consists of 100 semi-structured interviews with latrine adopters and non-adopters in Gujarat, Haryana, Uttar Pradesh, and the Nepali terai. In many other developing countries in the world, simple pit latrines costing $50 or less are commonly found in rural areas. These latrines often have pits that are roughly 50 cubic feet and inexpensive superstructures made of materials like plastic sheets, cloth, or sticks. The World Health Organization (WHO) promotes the use of latrines like these because they reduce the spread of disease by containing feces underground. Water seeps out of these pits into the ground, but because the soil acts as a filter, there is little risk of contaminating ground water. In Bangladesh, 39% of rural households use such latrines, and in Nigeria, 44% do. Even though the government has been promoting and building simple pit latrines for decades in India, only 10% of rural households use them. In fact, many more rural households in sub-Saharan Africa and the rest of south Asia use these kinds of inexpensive latrines than defecate in the open. India is the opposite: many more households defecate in the open rather than use these kinds of inexpensive latrines. Privately constructed latrines in use in rural India are very different from the kinds of latrines commonly seen in other developing countries: they have very large underground pits or septic tanks. 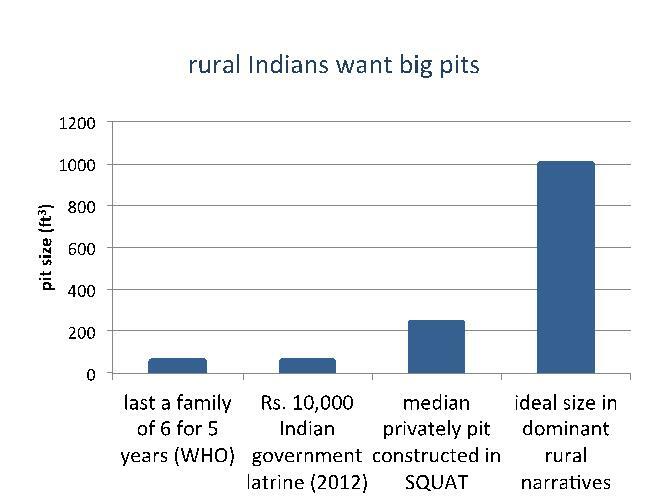 In fact, the median pit size of a privately constructed latrine in the SQUAT survey was 5 times the pit size recommended by the WHO, and our qualitative research suggests that households aspire to owning latrines with pits 20 times as big. The demand for very large pits drives up the cost of constructing a latrine considerably. When respondents in the SQUAT survey describe a “minimally acceptable latrine,” it costs on average $350. Much of the difference in cost between a Bangladeshi latrine, which might cost as little as $35, and an Indian latrine is due to the difference in the size of the underground pit. What do we mean by purity, pollution and untouchability? In Indian villages, ritual pollution is transmitted not only by certain spaces and objects, such as latrines or drains, but also sometimes by certain people, and by certain activities. Purity and pollution are also unifying ideas of the Indian caste system; people from the “untouchable” castes, or Dalits, are seen as permanently polluted and polluting to others. The pollution that Dalits embody is often used as a justification for their oppression and extreme social exclusion. In rural India, Dalits have traditionally been expected to do dirty, degrading tasks for higher caste households, such as the disposal of dead animals, and the manual removal of human feces from “dry toilets,” often with minimal compensation. Today, untouchability and caste-based social exclusion is slowly being renegotiated in rural India. The exclusion of Dalits from schools and water sources is less common than it once was, but it is still common for caste Hindus to refuse to eat food or take water from the houses of Dalits and to exclude untouchables from temples. An important part of Dalits’ struggle for equality has been through resistance to performing the kinds of degrading tasks that are associated with untouchability. Because of the high cost of vacuum extraction and disposal of sludge in small quantities, and because water seeps out of affordable pit latrines into the ground, latrine pits of about 50 cubic feet are emptied manually wherever they are used in other parts of the world. For a family of 6, the WHO estimates that it will take about 5 years for such a pit to fill. While manually emptying a pit latrine is often considered unpleasant in other parts of the developing world, it is extremely stigmatised in India because of its association with ritual pollution and untouchability. In rural India, caste Hindus will not empty their own latrine pits – it would be considered extremely degrading. Dalits also understandably resist doing this work because it is a symbol of their past and continuing oppression. The market for pit emptying services is broken. Hence, people do not invest in a toilet until they can afford one that will have to be emptied only very rarely. At the same time, open defecation is not only socially acceptable in rural north India, it is seen as a wholesome activity that promotes physical health. When performed in conjunction with other daily rituals, it is seen to promote the purity of the body. Positive attitudes about open defecation are reflected in high rates of open defecation despite latrine ownership: the SQUAT survey found that among households that own a latrine, 40% had at least one member who regularly defecates in the open. How can we accelerate the reduction of open defecation in India? In the long run, rural Indians are likely to be able to afford the kinds of toilets with large septic tanks or sewer connections that are used in cities and that sidestep questions of purity, pollution, and untouchability associated with affordable latrines. But do we want to wait that long? What will it take for rural Indians to adopt the kinds of simple pit latrines that prevent disease, save lives, and reduce stunting in the rest of the developing world? What would widespread adoption of such latrines mean for Dalits? Prime Minister Modi’s sanitation programme proposes ending open defecation by 2019 by government construction of simple pit latrines, like those recommended by the WHO, that require periodic emptying. However, most respondents in the SQUAT Survey who lived in households with government-constructed latrines defecated in the open. Continuing to construct the same kinds of latrines that rural Indians have rejected for decades, without changing the attitudes, beliefs, and norms that lead to this rejection, will not reduce rural open defecation. We don’t yet know what will accelerate the reduction of open defecation in India, and there is unlikely to be a silver bullet. What we do know, though, is that it will require frank and uncomfortable conversations about what purity, pollution and the continuing practice of untouchability have to do with rural India’s open defecation crisis.